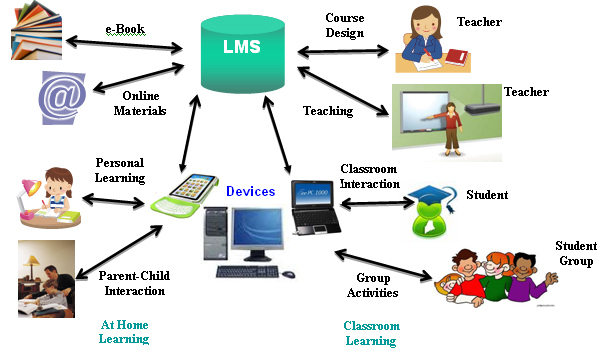 Intelligent Learning Management System – EduGrid!!! The grid has, both as members and users, students, teachers, researchers, administrators, vendors and entities that serve the education mission, community and market. The education framework is designed to deliver applications and data to the users across devices and operating system. The following are the salient features of the framework. End to End Management: The framework is built with an end to end management system. The management features include control, provisioning and delivery of the services like applications, content and storage, control of user end devices, etc. The management of services can be done remotely by relevant personnel through a web based interface. The framework has the ability to remotely debug each device and thus reduces the need for physical presence at remote location to take care of issues. Secured controls and storage: The controls and managed parameters are placed securely in the device such that users cannot access it and tamper with it. The same is true for the secure data of an institution. Support across multiple devices: Users can access their desktop, applications and data from a variety of devices. All the services are customized as per the user device’s capability. Currently, the solution is available on Microsoft Windows (XP, 7 and Vista), Linux, OSX, iOS and Android operating systems. Reporting: The solution capture session, application and Internet usage details and stores it on the server side. This data can be used to generate different types of report. Reports can be generated based on various filters. The usage data can be presented through tables and graphs and be exported as desired. Institution based desktop interface: An institution specific home screen can be created and made available across devices. Controlled set of applications and Internet: Access of applications and website that can be accessed can be controlled from a central location for one or more customers. The framework has the ability to remotely install and control these applications. Encrypted storage area on disk: This storage area can only be accessed during institutional session. The user cannot copy data out of the encrypted storage. A facility of automatic sync of encrypted storage to cloud can be provided. Conditional access control: The above mentioned controls can be provided using conditional access. The conditions can be based on time, network and location. Grid provides mechanism to plug in new components with minimal effort spent on interoperability. End users (students, teachers, etc.) have the freedom to choose devices and OS of choice. Grid customizes the user experience across the different types of end user devices. The framework also has the ability to re purpose existing devices (legacy IT infrastructure and other existing assets). Enables segregating users as closed and open communities and provide them with the ability to have real time interactions. Grid has the ability to provide analytics based on end user profile, Geo-location and interactions with the end user device. Based on the analytics an array of decisions can be made by the educational institutions. Grid enables third party applications and content players to overcome the issues of reach and fragmentation in education.